Discover a hand-picked selection of cabin resorts, rentals, and getaways in Mount Hood, OR. Deluxe luxury cabins invite you to relax in complete privacy. Plenty of outdoor recreation such as windsurfing, hiking & biking. Indoors, enjoy great food & our massage svcs. Alder Creek gives you charming log cabin lodging with privacy, lovely forest views and a fireplace for those cool nights. The ideal Oregon getaway. Spend your vacation in a rustic cabin beside the Sandy River. Ideal for any type of getaway. See an amazing video of what to expect. 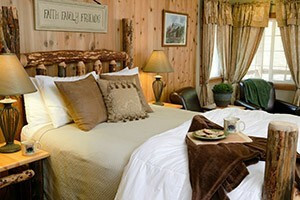 Enjoy a fabulous Mount Hood vacation in a rustic log cabin in the Cascades. Three bedrooms, sleeps up to 10. Utensils, linens, fireplace, hot tub. RV sites, tent camping and private cabins on the shores of Lost Lake in Mount Hood National Forest. No better place for a Oregon getaway! Romantic mountain tree house deep in the Southern Washington Cascades of the spectacularly scenic Columbia River Gorge - Be one with nature in the serenity of the wilderness! Offering two beautiful family cabins near Trillium Lake, just 7 miles from Mt. Hood. Idea for family groups or multiple couples.